Under Bingo & Ice Cream Social, select "Order" button on the right. **Please place all orders under your eldest child's profile. Fill out Order Form and click "Place Order & Proceed" to complete. Volunteers are also needed on the day. First 10 volunteers to sign up receive a free ice cream cupcake for Bingo Night! Admission is by donation at the door. An interactive and visual presentation designed to help parents understand where the social media and tech concerns exist in our connected community. A 'must-see' presentation for parents who would like to pro-actively examine the challenges of social media, explore the reasons behind the concerns around social media, and to help prompt dialogue at home that fits each family's values. You can still register for lunchtime Art Mania program Grades K - 7, from January 12 - March 8. See more details on our Programs & Events page. Grade 6's are at Outdoor School all this week. Have a great trip! 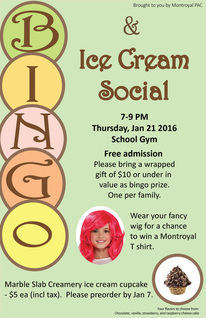 Join us for a fun filled community night, playing family bingo and munching on Marble Slab ice cream cupcakes (pre-order at montroyal.hotlunches.net by Monday). Please bring a wrapped gift of $10 or under in value as bingo prize. One per family. Remember to put on your fancy wig for a chance to win a Montroyal T-shirt.